Ladybugs (family Coccinellidae) are some of the most visually striking members of the insect world, with their intense red, orange, pink, yellow and black coloration. If you're fascinated by the dainty beetles and wish to look at them in action, you can keep them as temporary pets, as long as you establish a suitable habitat first. As far as enclosures for pet ladybugs go, you have several suitable options. Jars made of glass or plastic are often appropriate, as long as they're equipped with ventilated covers for air circulation. Lids made out of mesh work well. It's important that these lids are always extremely secure rather than loose, too. Petri dishes, aquariums and bug boxes can make good habitats for ladybugs, too. If you have a sizable transparent box made out of plastic, you might be able to turn it into a spacious and comfortable ladybug habitat. Make the box feel more like "home" for the insects by adding a few twigs and leaves to it. Twigs with leaves attached can provide ladybugs with places to relax and retreat. Since hiding is a big pastime for ladybugs, you can consider placing a segment of an egg carton upside down in the habitat. Moisture is a must for a successful homemade ladybug habitat. You can provide your ladybugs with the humidity they need by placing a moist cloth or paper towel on the floor of their enclosure. When you notice the medium getting dry, switch it out for a new one. You can also satisfy ladybugs' moisture requirements by spritzing a bit of H20 in the habitat once a day. Place the habitat in a location that's comfortably warm and gets ample sunlight, like a windowsill. If you're seeking ladybugs to bring into your home as pets, go outside to look for specimens during a warm and pleasant time. The spring can be a good time to do this, as can the summer. When you spot a ladybug, refrain from retrieving the little guy with your fingers. Doing this could hurt him. Instead, get a paintbrush to handle the job. With a paintbrush, you can direct the ladybug into the designated enclosure. When you're ready to release your ladybug, kindly let him go in your garden. Just make sure to wait until the weather is warm. Make sure you see plenty of aphids on the plants outdoors, too. 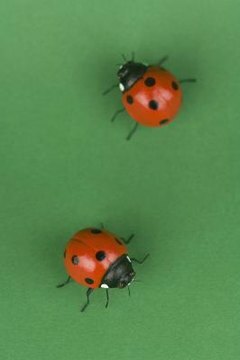 Aphids are ladybugs' big dietary staple.